The Nigeria-Biafra conflict (1967-70) revolved around the south-eastern part of Nigeria’s attempted secession and establishment of its own republic, Biafra, in the wake of British decolonisation. Soon after the outbreak of hostilities, the Nigerian Federal Military Government (FMG) blocked the Biafran region from air, land, and sea, which lead to widespread famine in 1968. Widely circulated media images and stories from Biafra mobilised unprecedented international attention to and solidarity with the suffering civilians and a range of international humanitarian organisations provided relief to both sides of the conflict. From mid-1968, four humanitarian airlifts, of which the airlifts of the International Committee of the Red Cross (ICRC’s INALWA airlift) and the Protestant and Catholic churches (the Joint Church Airlift) were the largest, flew relief into Biafra at night. Africanist scholar Alex de Waal has since labelled the relief operation both totemic and taboo: Totemic because of the logistical achievement and the physical courage of the involved players. Taboo due to the ethical dilemmas faced by the humanitarian organisations criticised for prolonging suffering by lending moral support to the Biafran struggle and being a cover for arms shipment to the region. When the war ended in January 1970 with a Biafran defeat, an estimated two million people had died from fighting, starvation and illness. 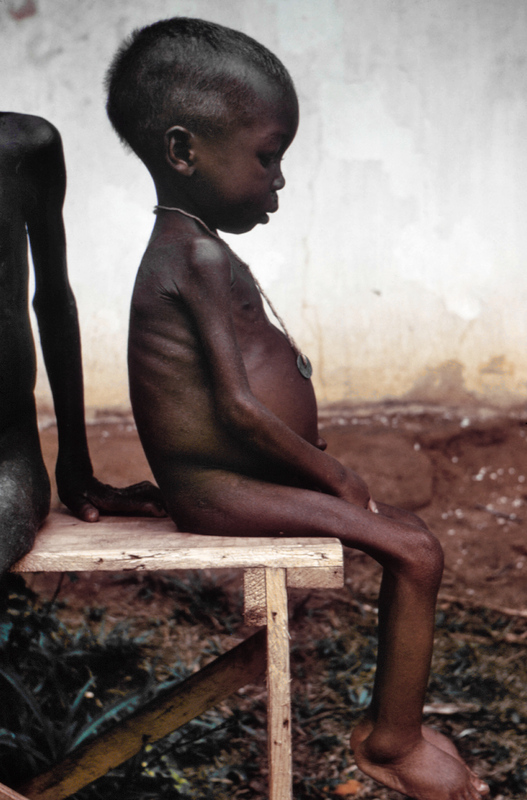 Child suffering from Kwashiorkor, found in Nigerian relief camps during the Nigerian–Biafran War, late 1960s (Center for Disease Control and Prevention, Atlanta, Georgia, USA/Public Health Image Library). By Dr. Lyle Conrad [Public domain], via Wikimedia Commons. In established narratives on the humanitarian relief operation in Biafra, the humanitarian engagement marks a clear-cut rupture from state-centric, traditional and neutral humanitarianism represented by the ICRC to more interventionist, politically aware, and media-oriented approaches represented by new organisations emerging from the conflict of which Médecins sans Frontières (MSF) and its focus on témoinage (witnessing) is the most renown. However, while important changes within the humanitarian community arose from the operation in Biafra, a more complex picture emerges when exploring the ambiguous role of the ICRC in the conflict linked to questions of responsibility, access, and protest. In light of only marginal involvement from major political actors such as the United Nations and the Organisation of African Unity due to an explicit non-interference policy in Nigerian internal matters, non-governmental humanitarian organisations took primary responsibility to respond to the suffering witnessed in Biafra. The Geneva Conventions of 1949 did not adequately cover non-international armed conflict at the time and the ICRC’s de facto role as overall relief coordinator required acceptance from the Nigerian and Biafran authorities. While prioritising dialogue and cooperation with both parties throughout the conflict and collaborating with the Nigerian and Biafran Red Cross Societies, the ICRC’s airlift operations were, especially at the end of the conflict, also seen by some parties as an intervention breaching Nigerian sovereignty. Further, while the ICRC was responsible for coordinating relief activities, it lacked the power to coordinate the work of other agencies, which placed them in a delicate position where it was seen as both collaborator and competitor. Within the ICRC, negotiations on how to gain access to victims show how the conflict served as a testing ground for ways of alleviating suffering on the ground, which questions the simple framing of the ICRC as conservative and slow to respond. Besides its traditional assistance to prisoners of war, wounded, and missing, its attempts to provide relief to Biafra involved a range of negotiations with the belligerent parties on the establishment of airlifts, attempts to institute land corridors, to provide relief by sea, to parachute in relief from the air, and to evacuate a selection of the most needy victims by transferring them to Europe through a “medic airlift”. The central question was how to reach those most in need – mainly on the Biafran side of the conflict – and follow the principle of impartiality, while demonstrating neutrality in order to ensure continued access from both sides of the conflict. Further, the ICRC’s internal deliberations indicate that the organisation’s stance on whether or not to speak up when witnessing atrocities is more ambiguous than conveyed in the established narrative on Biafra in which the ICRC’s focus on confidentiality and state cooperation is framed as a hindrance to public protest. The ICRC’s management conveyed protests from its field delegates to relevant authorities following federal bombings of civilians and humanitarian premises, made several public appeals, and published a critical article on the federal attacks written by doctors from the French Red Cross Society in its own organisational journal The International Review of the Red Cross. The humanitarian operation in the Nigeria-Biafra conflict represented a great test for the international humanitarian system. Within the ICRC, the immediate consequences of Biafra were organisational debates and decisions to reform its management of operations, personnel, and communication (see the Tansley report, 1975). At a broader level, there was an expansion of non-governmental organisations directly involved in field operations thereby marking the beginning of an age of global governance with growing expectations to the role of humanitarian actors in armed conflict. In 1977, the Protocol Additional to the Geneva Conventions of 12 August 1949 relating to the "Protection of Victims of Non-International Armed Conflicts" was adopted. Historiographically, Biafra holds a pivotal position in literature on the ICRC’s own institutional history characterised both as a failure and as formative for the development of the organisation. Likewise, MSF’s founding narrative relies heavily on the “myth of Biafra” and the action of the French doctors, e.g. Bernard Kouchner. Biafra also features in studies on genocide, famine, humanitarian intervention, and humanitarian emergencies depending on the framing of the conflict. Stremlau, John. The International Politics of the Nigerian Civil War, 1967-1970 (Princeton: Princeton University Press, 1977). St. Jorre, John de. The Brothers’ War: Biafra and Nigeria (Boston: Houghton Mifflin, 1972). Wiseberg, Laurie. The International Politics of Relief: A Case Study of the Relief Operations Mounted During the Nigerian Civil War (1967-1970) (PhD dissertation, University of California, 1973). Hentsch, Thierry Face au Blocus. Histoire de l'intervention du Comité international de la Croix-Rouge dans le conflit du Nigéria, 1967-1970 (PhD dissertation, Université de Genève, 1973). Desgrandchamps, Marie-Luce. ‘Dealing with “genocide”: the ICRC and the UN during the Nigeria–Biafra war, 1967–70’. Journal of Genocide Research 16, No.2-3 (2014): pp. 281-297. Desgrandchamps, Marie-Luce. ‘Entre coopération et concurrence: CICR, Unicef et organisations religieuses au Biafra’. Relations internationales 4, No. 152 (2012): pp. 51-62. Barnett, Michael. Empire of Humanity – A History of Humanitarianism (Ithaca: Cornell University Press, 2011). Waal, Alex, de. Famine Crimes: Politics and the disaster relief industry in Africa (London/Oxford/Indiana: Bloomington, 1997). Heerten, Lasse and Moses, A. Dirk. ‘The Nigeria-Biafra war: postcolonial conflict and the question of genocide’. Journal of Genocide Research 16, No. 2-3 (2014): pp. 169-203. Mie Vestergaard, PhD researcher at International Development Studies at the Department of Society and Globalisation, Roskilde University, Denmark. Current doctoral research project (2012-2016): “Humanitarian Engagement with Victims of the Nigeria-Biafra conflict 1967-70” which focuses on the role of the International Committee of the Red Cross in categorising and providing relief to victims in Biafra, drawing on ICRC’s organisational archival records. Mie was a participant of the Global Humanitarianism Research Academy(GHRA) 2015. Citation: Mie Vestergaard. ‘Biafra, 1967–1970: Ethical Dilemmas of Humanitarian Relief’, in Online Atlas on the History of Humanitarianism and Human Rights, edited by Fabian Klose, Marc Palen, Johannes Paulmann, and Andrew Thompson, 2015-12, urn:nbn:de:0159-2016090525 [2019-04-19].